Sugar is all around us. It's in our snacks, drinks, medications, and meals. We are so accustomed to how sweet our foods are that most times we don't even notice it. There are a few problems with eating so much sugar. First, it is a source of empty calories. Sugar gives you energy, but doesn't give you fiber, vitamins, minerals, or protein. Unfortunately, if you don't use that energy right away, it gets stored as fat. Second, we know that a diet higher in simple carbohydrates like sugar may lead to inflammation and chronic diseases. In general, limiting your sugar intake is a great first step to maintaining good health. It's easy to confuse sugar with carbs. Carbohydrates are a larger class of nutrients that convert to glucose in our bodies to feed our brains and cells. Many foods have carbohydrates in them; some of them even have natural sugars. Fruit, dairy, and some vegetables have naturally occurring sugars, but are also packed with vitamins, minerals, protein, fiber, and other things your body needs to function at its best. Let me be clear, I don't recommend avoiding fruit because it has too much sugar. Instead, I recommend cutting added sugar from your diet. 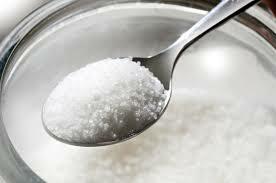 Added sugar refers to any sweetener added to a food that isn't there naturally, mainly for taste and texture. Obviously sweeteners like sugar, corn syrup, and agave are added sugars, but so are fruit juices, honey, molasses, and maple syrup. Those items add sweetness and calories, but aren't providing any other nutrients. Added sugars can quickly increase your calorie intake, and are easily stored as fat in the body. Want to cut added sugar from you diet? Check the nutrition facts label, especially the ingredient list. Look for words like sugar, cane syrup, fructose, corn syrup, agave, honey, or sucrose. Don't be fooled by health buzz words- organic cane syrup has just as many calories as bleached white granular sugar. Aside from obvious sources of sugar like sodas and candies, some foods high in hidden sugar include packaged oatmeal, cereals, flavored yogurts, jarred sauces, and canned or jarred fruits. Look for unsweetened products or items that say 'no added sugar' (then check the label and make sure they didn't add sucralose or other artificial sweeteners). If those products aren't available, compare different brands and find the lowest sugar item. Better yet, make food at home where you can control the ingredients. It's important to be aware of your sugar intake. You may think your diet is low in sugar just because you don't eat sweets- but you could be wrong. Take some time to read the labels on your favorite foods and get a sense of just how much sugar you eat each day. Then, try to cut back the added sugar. You don't need it- you're sweet enough already!